For starters, not everyone knows that there is a difference between tapping and drilling. Drilling is when you use a drill press (or similar, like hand drill) to create a smooth hole in a material. Where as tapping is the action used to create a thread in a hole. 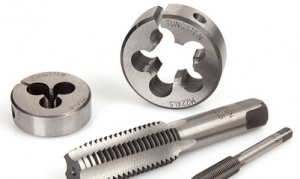 You may have heard of the “Tap and die”. A tap is the part used to form the “female” part of the pair, for example a nut. Where as the die is used to create the male part (for example, the bolt) this is called threading. There’s many different kinds. There are bottoming taps which can be used to create the thread at the bottom of the hole. taper taps that are used to thread a hole gradually, and many other types for all tapping purposes you can imagine. When you are deciding which type of tap to use, you should consider factors such as the material, and the width and depth of the hole. Some other tips you might want to consider when you’re using your drill press for tapping. One idea is to drill a pilot hole first, a hole roughly half the size that you desire the final hole to be. the ensures a precise and accurate starting point. It also pays to use a lubricant while for tapping – you can purchase special tapping fluid. Depending on the material you are working with you might need a certain type of fluid. For steel petroleum based/synthetic cutting oil should do the job. On alloys it pays to mix in 10 percent of mineral spirits with the cutting fluid. And finally, if you’re working with Aluminum you will want to use cutting oil with mineral spirits in a ratio of 15(cutting oil) : 85 (mineral spirits). If you don’t have mineral spirits kerosene is a good substitute. Hopefully you found these tips useful. To ensure your safety check out the safety guide. Read more about tapping and threading here.